The lure of power and the promise of life unending is a potent mixture that can intoxicate even the noblest of souls. Those who wish to drink deeply from this cup must learn the dark arts of Necromancy. Necromancers are the mages who draw power from the Netherworld, life from death, life in death; it is the life of the undead. A question remains though: is the price worth the power? In his quest for command over the dead and the power that lies in what the unlearned soul calls dead, Necromancers form an uneasy truce with the powers of the Netherworld. Necromancers must be an Evil alignment for the nature of their magik is a violation of the natural order and is an affront to all of good alignment. They are anathema to those who cherish life and hold it sacred, thus there is a great enmity between Necromancers and Druids, as well. Even so, Necromancers walk in that hidden place that exists between the planes of primal existence and those of the spirit and are forever changed by that journey. Who but they can say what wisdom and knowledge is gained! The primary abilities of this class are Intelligence and Constitution. 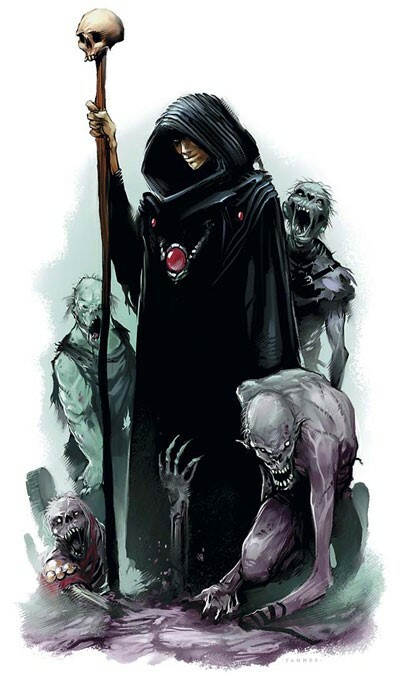 Con: 13 Necromancy: The Necromancer can command the undead just as a Priest of the same level. Furthermore, they may attempt to turn creatures of the outer planes that are of good alignment as per the Rebuking Table. Con: 14 Aura of Desecration: An aura is now centered on the Necromancer and creates a weak negative energy effect that strengthens undead. All Undead gain +1hp per HD, and resist Rebuking at one level higher on Rebuking Table. This has the reverse effect for the Necromancer seeking to gain command of the undead, causing them to be affected as if one level lower on the Rebuking Table. Con: 15 Cause Fear: As the spell against any being of 4Hd or less within a 20’ radius, unless a save vs. Necromancy is made. Target will flee at fastest possible rate or if unable to flee will cower incapable of performing any standard actions. The effect lasts for a number of rounds equal to the Necromancer’s level. Con: 15 Aura of Negative Energy: A permanent aura now surrounds him in a 1’ radius that he may activate at will (one standard action). Anyone making physical contact or stepping into the zone of effect suffers the loss of 1LP per touch. Further, the Necromancer is protected from all Negative Plane energy draining. – When not in melee combat, the Necromancer cannot be the subject of Attacks of Opportunity. – The Necromancer has slipped behind the curtain of reality that lies between the Prime Material Plane and the Netherworld. As a result he cannot be killed in the standard fashion for his soul no longer resides within him. If reduced from 0 to -9 HP the Necromancer goes unconscious but revives 24 hours later with 1 HP and can be healed as normal. If reduced to -10 the Necromancer goes unconscious but revives one week later. * In order to permanently slay a Necromancer you must destroy his Soul Cage*. *See Death Chart below. Necromancers spend many hours studying the tomes of the dark arts, conjuration of infernal creatures, and the concentric of death. During the course of this study they have gained several abilities. Seeking out a master of the dark arts, the novice wanders the forbidden corners of the world to find an adept who can show him the way. Now, coming under the tutelage of his master the Necromancer will be given three spells per level for the first four levels. He will choose his Soul Cage, which may be upgraded at each title mark. The character must have a minimum Intelligence of 12 and Constitution of 13. For the first four levels the Necromancer is being taught by his master but Necromancy is a profession that does not permit close friendships. As such the Necromancer must then take on his own education and research upon attainting the rank of Adept. He will be responsible for paying for his materials and hunting down or negotiating for more spells as he advances in levels.